It’s always inspiring to find projects that exist to fuel the creative drive of any community, which is why we are absolutely ecstatic to be collaborating with Made In The Lower East Side to bring to life our Collective Futures NYC exhibition on October 4th. As a community incubator, miLES activates unused spaces on a short-term basis to lower the entry barrier for creative, entrepreneurial and civic projects. Their latest venture is to transform a vacant storefront into a pop-up neighborhood hub with 7 themes: Show, Play, Learn, Share, Make, Shop, and Eat. 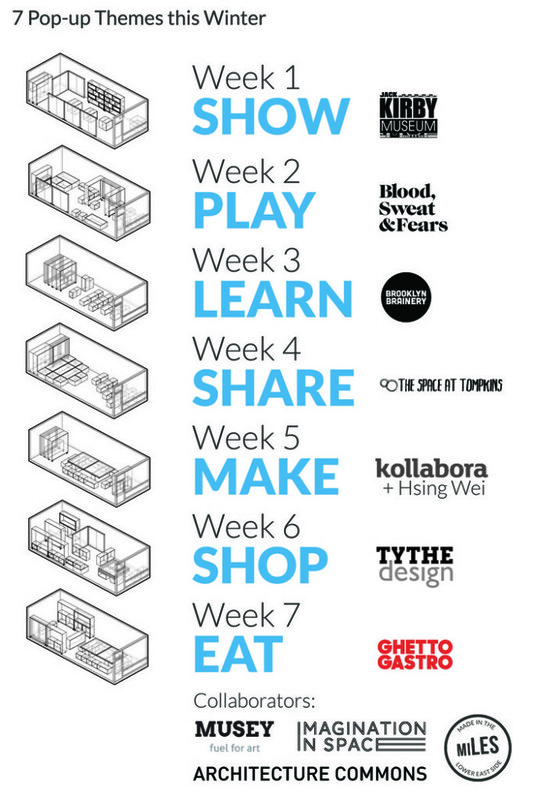 To do this, they are collaborating with 7 different brands who will take over the space for one week each to engage the local community through different means, from DIY workshops to a deli-styled culinary experience. Supporting their project now means they’ll be able to incubate more amazing ideas and create more pop-ups in the future! CF: Tell us a bit about how miLES came to existence. Who are the people behind it and what is the inspiration behind your ethos and way of doing things? miLES came from the observation of a lot of vacant storefronts in a vibrant neighborhood in the Lower East Side. It came as a surprise and then a discovery of why they were vacant. It also simultaneously came from an online project on the crowdsourcing platform OpenIDEO of a challenge on how to vitalize the city of Detroit. Those two simultaneous observations led me to reach out to a few of the OpenIDEO winners and together we launched a “realization phase” of the challenge in the Lower East Side. It’s a diverse number of collaborators, first online, then within the community with people that have many different areas of expertise and a wide range of backgrounds. It is truly a group of civic and like-minded individuals and then organizations, joining forces to think about how to re-vitalize a neighborhood. We want to see how we can use design thinking and community input to create positive changes for the neighborhood. CF: Why do you think it’s relevant to preserve and give use to vacant spaces in the Lower East Side? What does this neighborhood offer that others don’t? The use of vacant spaces in the Lower East Side is really an opportunity to use valuable real estate in a new way, and also giving the opportunity to small business owners, creatives, and civic minded individuals to use the space, instead of having bars, restaurants, or chain stores. The neighborhood offers an interesting mix of artistic, entrepreneurial, and community spirit; combined with different income groups and a wide diversity of ethnic communities it offers a unique place to see how we can bring a diverse group of residents together. CF: Your latest project is a “Storefront Transformer” in the shape of a Kickstarter campaign. Can you tell us a bit more about the scale of this project and what you hope to achieve with it? 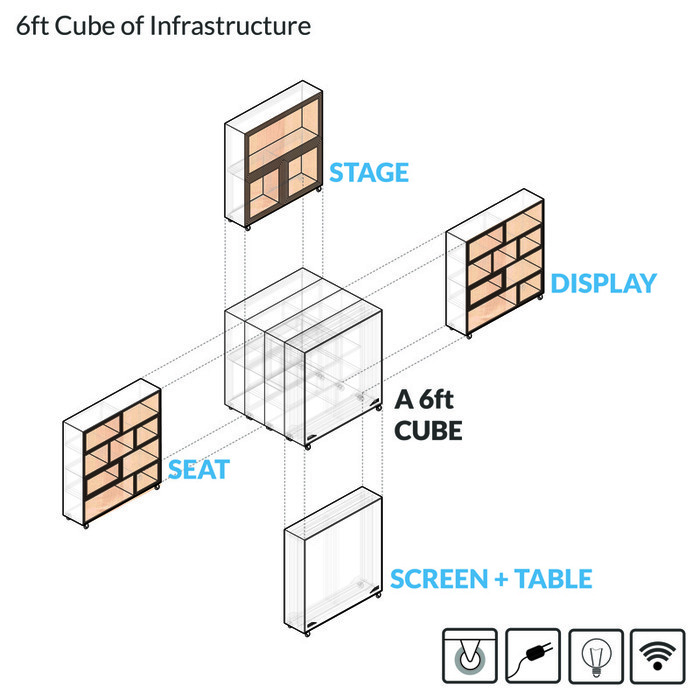 The storefront transformer is a set of furnishing that can provide all the basic infrastructure and ingredients that you would need to create your own pop-up, including a stage set, a display and seating set, and a table and partition set. It also comes with power strips, lighting, WIFI, etc. As a first step, we want to demonstrate the use of this storefront transformer for 7 weeks this winter in a vacant storefront with a variety of creative pop-ups uses from a comic museum to a non-profit home to maker-space and eatery. The ultimate goal is to create opportunities to incubate emerging ideas, and create a neighborhood for the ideas to grow. We want to replicate this project into a more sustainable effort throughout next year. We have 12 collaborators behind this project, including 7 amazing pop-up curators, from the Jack Kirby Museum celebrating a central cultural figure, Jack Kirby, who was born and raised in the Lower East Side; to non-profit group The Space at Tompkins providing a space for homeless travelers. A Maker Salon curated by Kollabora and The Makery, and the recreation of a deli experience by 3 emerging chefs from the Ghetto Gastro collective. CF: What’s your favorite thing about living in New York? Diversity and energy, everyone can find something that they are passionate about in New York City. 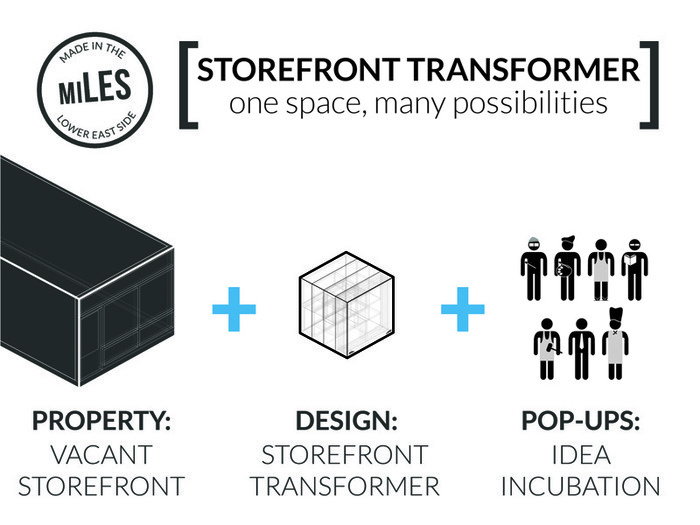 CF: What does the future hold beyond this year’s Storefront Transformer project? We want to disrupt the real estate market by providing short-term rentals and providing storefronts that are accessible to everyone. We think that this is a sustainable model given the right ingredients and circumstances, and we are fine-tuning how best to create those conditions. It is still work in progress and we hope we would get to something more developed next year learning from our experiences this year.